The Princeton University Art Museum is now a major repository of paintings by the German artist Gabriele Münter (1877–1962), thanks to the generosity of Frank E. Taplin, Class of 1937, his wife Margaret (Peggy) Taplin, and their family. The Taplin family assembled a distinguished group of works by Münter, and in 1992, they gave the Museum the artist’s famous self-portrait of ca. 1908–09. In that painting, Münter sits before an easel, wearing a wide-brimmed straw hat, as a proper bourgeois lady, her penetrating gaze directed at what must be her reflection in a mirror; still young, she shows the life experience and determination that helped her persevere as an artist at a time when many official doors were closed to women. After Mr. Taplin’s death in 2003, Mrs. Taplin presented the Museum with Mother of Kandinsky (1913) and Kahl (1949). Mrs. Taplin died in 2011, and the Museum has now received three further works given in loving memory of Mr. and Mrs. Taplin: Fisherman’s House (1908); Kandinsky and Erma Bossi (1910); and From Norway (Tjellebotten) (1917). These magnificent gifts document Münter’s artistic development, her themes, and her inner emotional life over four decades. Gabriele Münter became a living symbol of the daring artistic breakthroughs and achievements of modernist artists in pre–World War I Germany and was much honored. More recently, feminist art historians have championed her. Gabriele Münter was born in an era of new possibilities for women, yet in Germany there was still resistance to women artists. Ineligible for the Art Academy in Düsseldorf, she enrolled instead at the Painting School for Women in 1897. In 1902, she transferred to the more progressive Phalanx School, where she studied with the Russian artist Wassily Kandinsky (1866–1944). Following classes in still-life painting, she was invited in the summers of 1902 and 1903 to join his landscape painting classes, held in country towns. The relationship between teacher and student progressed from friendship to love affair. It was an artistic partnership as well as a personal one: Kandinsky urged Münter to paint, although she sometimes had doubts about her career. From 1904 to 1908 the couple traveled in Europe and North Africa before returning to Munich. Fisherman’s House dates from this era. Its bright colors and geometric, abstracted shapes show the influence of the folk art that Münter liked and collected, especially Bavarian reverse paintings on glass. During this period, Münter purchased a house in Murnau and she and Kandinsky divided their time between the small town and Munich. Artists from the New Artists’ Association Munich (NKVM) met in Murnau. In Kandinsky and Erma Bossi, Münter evokes that period, showing Kandinsky in animated discussion with one of the few other women artists of the group. In 1911, Kandinsky, Münter, and Franz Marc (1880–1916) left the relatively conservative NKVM to form a new group, the Blue Rider, leading to a short-lived movement of the same name that produced some of the most vibrant art in German modernism. 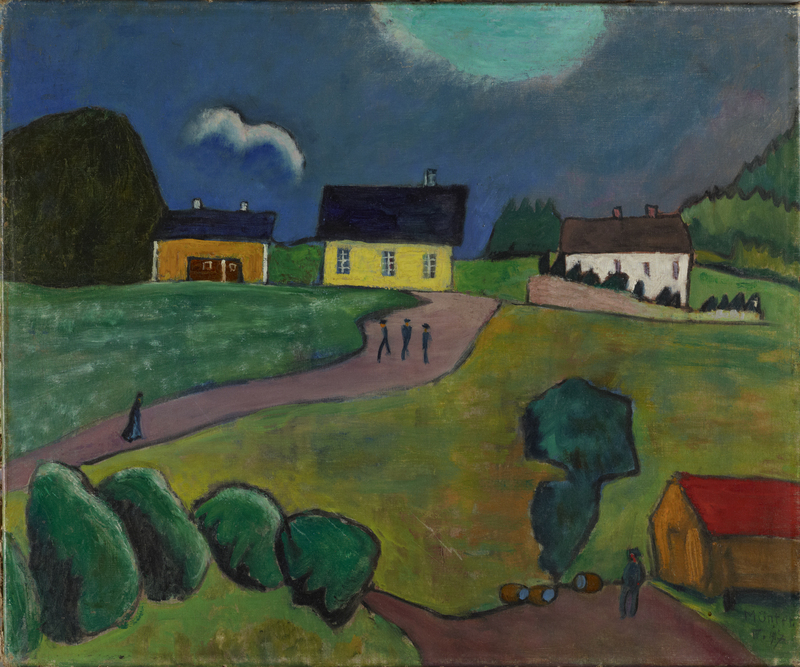 From Norway (Tjellebotten) recalls children’s drawings and is less bold than Münter’s earlier, expressionistic creations. For some years in the 1920s, Münter ceased painting altogether. Her new companion, the art historian Johannes Eichner, encouraged her to paint, however, and, late in that decade, she took up the brush again. In the post–World War II years, Münter returned to her house in Murnau and found intact the cache of her own paintings and works by her fellow artists that she had hidden there. The survival of these works seemed miraculous given that the Nazis had considered members of the Blue Rider group to be “degenerate artists” and many of their works were lost.